Following the opening of The Harrogate Grille within the town's Balmoral Hotel in June 2007, owners John Pallagi and Simon Wright of the restaurant group Room Restaurants are continuing with their rapid growth plans of positioning stand alone restaurants within hotels. With units in Liverpool, London, Manchester, Harrogate and Leeds, Room Restaurants have now opened their sixth restaurant The Lincoln Grille within the beautiful White Hart Hotel — located alongside the mediaeval splendour of Lincoln Cathedral and the imposing walls of Lincoln Castle. Owned by Ambar Paul, son of Lord Paul of Marylebone, the 50-bedroom White Hart Hotel is operated by his company Contemporary Hotels. The new refurbishment of the Hotel has cost over £1m — with Room Restaurants' contribution over £350,000. The ground floor of this hotel, which dates back to the 14th century, comprises three units. This month the second phase, 60-capacity club lounge called Room Bar opened inside the reception and main hotel entrance area of a building. Architect and designer Gabriel Murray of Murray 03 had the daunting job of bridging the character of the hotel with the modern approach taken by Room Restaurants, while technology integrators, The Sound Division Group also treated the Grade II-listed building with great sensitivity — first distributing multiples of white JBL Control 25 and Control 23 loudspeakers in the restaurant, adjoining bar and conservatory to provide an aesthetic solution, before turning their attention to the Club Lounge. Operating off different play lists (depending on trading cycle), music is fed from an HD player to the new Club Lounge — powered by a Cloud multi-channel A6 amplifier and played out through strategically-placed WORK loudspeakers. Processed in a dbx 2115 graphic EQ to keep the music at optimum quality, a Cloud Z8 zoning unit ensures that the appropriate signal source is relayed to the correct area, with strategically positioned Cloud RSL6 panels offering remote source and volume selection. The Sound Division Group has been pumping out top grade sound systems to their long-standing client for over five years and has seen how this dynamic restaurant group has grown from close quarters. 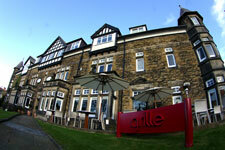 During this time Room Restaurants have been making a name for co-operative joint ventures with independent hoteliers. In London they have partnered with Sinclair Beecham (founder of Prêt a Manger) on the Hoxton Hotel project, in Liverpool they teamed up with Centre Island Hotels, owners of 62 Castle Street (Liverpool's latest boutique hotel) and more recently with Contemporary Hotels in Lincoln – The White Hart. "I think we've been lucky with the buildings we've found," says Pallagi. "Food and beverage management can be seen as a headache for hoteliers and we manage that burden for them whilst also giving the hotel restaurant a feel of independence from the hotel; we market the restaurant as a restaurant open to the public." Simon Wright goes on to say, "Our menus comprise classic brasserie dishes, competitively priced, served in a comfortable environment, from breakfast through to dinner. This is accompanied by great music playing throughout the day, and DJ's at weekends." Although there is uniformity between all sites, there are local variations. For instance, the 85-cover Harrogate Grille serves a varied clientele with everything from power breakfasts to cream teas, operating different play lists for Breakfast, Lunch, Early and Late Evening. In this gentrified environment, The Sound Division Group has undertaken a highly cost-effective re-servicing solution of the Bose system and redesign of the different sound zones nestled within the 23-room hotel. This provides even site-wise coverage. Meanwhile, the 30-cover private dining room downstairs operates off its own dedicated system played out through JBL Control 24C loudspeakers. 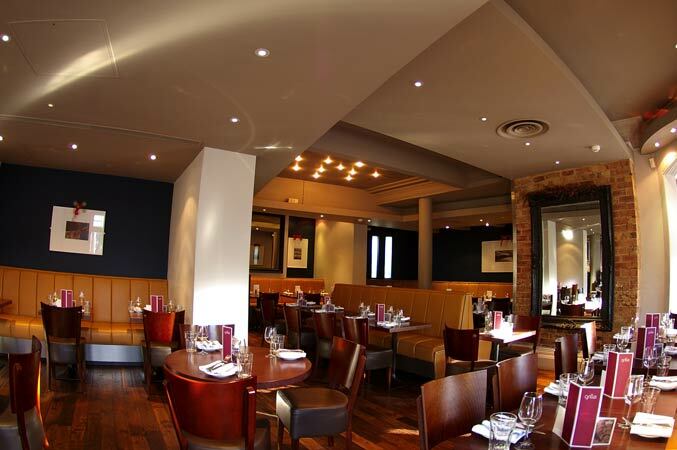 In addition to the Grilles, SDG has helped upgrade a number of the original Room Restaurants, including the independent sites in Manchester, and Leeds and the Liverpool site which is similarily housed in the centrally located Trials Hotel. David Graham, Managing Director of Sound Division, says: "We have enjoyed a long relationship with Room Restaurants. Their restaurant concepts are innovative and the atmosphere required varies from a bustling hotel lobby environment, to a stand alone city centre high volume fast brasserie where they are providing catering facilities from dawn to dusk, and offering the complete dining experience."